The albums on this page are all collaborations among multiple steel players. You won't find projects like this in most mainstream record outlets. 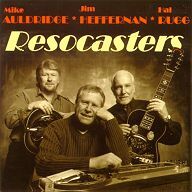 They are unique to the steel guitar community. Three of the hottest acoustic steel guitarists in the world unite their talents in a tour de force of bluegrass and country swing. Recorded in 2002, this CD is sure to become a classic. 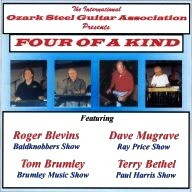 From America's heartland, Branson, Missouri, comes this country instrumental CD by four of the city's top steel players. Terry Bethel produced this album with a top-notch Branson backup band. Each of the steel players is featured on two songs, and each takes a turn in the two "Four of a Kind" songs. Non-pedal players will enjoy Tom Brumley's tribute to Jerry Byrd on Panhandle Rag, but there really isn't a bad track on this CD. It's great listening from start to finish. 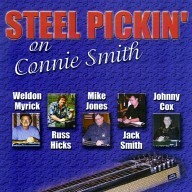 "Steel Pickin' on Connie Smith"
Five of the hottest pickers in Nashville take turns playing instrumental versions of Connie Smith tunes. The icing on the cake is a guest appearance by the singer herself, singing her big hit "Once A Day". Produced by steeler Russ Hicks, the CD also features Gregg Galbraith on lead guitar and Bob McCracken on drums. If you're looking for fine country steel, it just doesn't get any better than this!